Trachylepis punctatissima is distributed in Southern Africa, where it can be found in Lesotho, the Republic of South Africa, western Swaziland, and southern Botswana (BRANCH 1998). Type locality: “Northeastern districts of Cape Colony” (SMITH 1849). 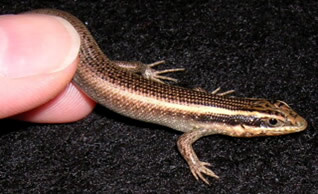 This is a moderately large (SVL 8 cm) skink (total length 19 cm). T. punctatissima is diurnal and ovoviviparous, meaning giving birth to fully developed young. The back is dark brown with a golden brown dorsolateral stripe on either side. The lower side is light, i.e., dirty white to light grey, and the neck is spotted and dotted with black. These skinks love it bright and warm. In my case, a halogen spotlight of 20 W, which produces a hotspot of approximately 55°C, and two T8 18 W fluorescent tubes (LF 11/860) are sufficient to provide what the animals need. In South Africa, they bask in the bright sun throughout the day, even when temperatures far exceed 30°C in the shade in summer. Their terrarium should not fall short of 80 x 40 x 60 cm (lxdxh) for a pair, but larger is always better. Its side and rear walls should be covered with natural cork, to which are added some cork branches or tubes, to enable the skinks to climb around as they wish. I have opted for ordinary potting soil without chemical additives for a bottom substrate. Planting the tank with live plants has proven beneficial to the health of the animals. These provide cover and therefore a sense of safety, which prevents them from fleeing the moment they detect movement outside their terrarium. I have rarely observed them on the ground other than for pursuing prey. These lizards are truly voracious and will consume just about every insect they can get hold of! I feed them with various crickets, mealworms, and wax worms and moths. All food is fortified with Vi-Spu-Min (Backs®). Trachylepis can be kept in pairs as there is no aggression whatsoever between the sexes. Juveniles are tolerated for their first 4-5 months as well. Establishing a colony is impossible, however, as two males or two females will cause each other so much stress from chasing each other around that one will succumb to it earlier or later. Mating is initiated by the male rhythmically bobbing his head and slowly approaching the female. If she is ready to mate, she will remain calmly in place and permit the male to “scratch” her body. This is soon followed by the male placing a holding bite on the female’s neck. Copulation is then rather reckless, but only takes two to five seconds. Babies measure 67 mm in total length on average (SVL 27 mm) at birth. Their colour pattern resembles that of the adults save for their appearing a little lighter, almost bronze-coloured. Juveniles need to be fed every day and will not survive longer periods without food. It is important to offer them only prey of manageable size. I feed them mainly with small crickets of various species, but they also readily take fruit flies (Drosophila). All food is dusted with Vi-Spu-Min (Backs®). If the baby skinks feed on their own – which is what they normally do – raising them is easy. After four to five months at the latest, I will separate them from their parents in order to prevent stress. Depending on their local occurrence in South Africa, Trachylepis punctatissima will observe a period of hibernation. This leaves them at an age of round about one year when they start reproducing. Skipping hibernation in a terrarium may see the males courting females at an age of nine months already. Keeping these comparatively unspectacular skinks from the south in terraria has been a gratifying experience for me for several years now. For once, it is their continuous presence, for the other their observant behaviour, and last but not least their principally undemanding nature that continue to enthuse me. I can therefore only warmly recommend this species to everybody with an interest in skinks or lizards in general. Auerbach, R.D. (1987) - The Amphibians and Reptiles of Botswana. - Gaborone Printing Works, Botswana, 295 pp. BRANCH, B. (1998): Field Guide to Snakes and other Reptiles of Southern Africa - Struik Publ. Ltd, Cape Town, 399 pp. BROADLEY, D. G. (1977): A review of the Mabuya striata complex in South-East Africa (Sauria: Scincidae). - Occ. Pap. Nat. Mus. and Mon. Rhodesia, 6B (2): 45-79. FITZSIMONS (1943): The lizards of South Africa. - Transvaal Mus. Memoir No.1 (Pretoria), 528 pp. NORVAL, G. & NORVAL, A.W. (2007): Eine Beschreibung der opportunistischen Futtersuche beim Gepunkteten Skink, Trachylepis punctatissima (SMITH, 1849) in einem städtischen Lebensraum - SAURIA, Berlin, 29 (2): 43-46. SCHILLERT, A. S. (2009): Erfahrungen bei der Terrarienpflege des Gepunkteten Kapskinks Trachylepis punctatissima (SMITH, 1849) - SAURIA, Berlin, 31 (2): 5-12.